Nikon has revamped its projector-equipped camera to allow images stored on a computer to be viewed via the projector. 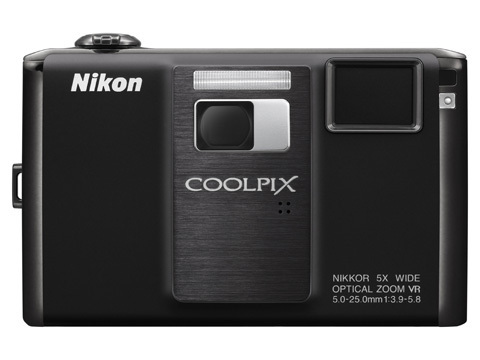 Nikon claims that the projector on board the Coolpix S1100pj is also 40% brighter than its predecessor, enabling images to be easier to see when projected against lighter surfaces, for example. The 14.1-million-pixel S1100pj can be hooked up to a Mac or PC so that stored images or presentations can be viewed through the projector, explains Nikon. Features include a 5x zoom lens (28-140mm equivalent) and a 3in (460,000 dot resolution) touch screen. New digital effect modes include fisheye, background softening and selective colour highlighting for monochrome images. The Nikon S1100pj will be available in black or green and will go on sale on 16 September, priced £349.99. 14.1 megapixel resolution lets you capture outstandingly detailed images, crop creatively and produce stunningly sharp poster-size enlargements. Built-in projector lets you project your favorite photos or movie clips. Offers bright (up to 13 lumen), VGA quality projections at 26 to 240 cm (5 to 47 inches) screen size. Camera boasts a built-in projector stand. Projects images from a PC or memory card: connects to a computer to project anything from a PC or Mac and lets you project PowerPoint presentations (saved as JPEG images) directly from the camera’s memory card. 5x anti-blur automatically counters blurred images in five different ways. Hybrid VR (Lens-shift and Electronic Vibration Reduction) reduces the effect of camera shake. High ISO (up to 6400*) light sensitivity reduces the risk of blurred images with fast-moving subjects or in low-light. Motion detection compensates for camera and subject movement. Large 7.5 cm (3-inch) high resolution LCD touch-screen (460K-dot) for intuitive, smooth operation. Boasts Nikon?s innovative Clear Color Display technology that reduces power consumption and minimizes reflections, enhancing visibility even in bright sunlight. Crisp HD (720p) movie clips: a dedicated record button instantly lets you capture the action at an impressive 30 frames per second. Retouch Menu enables you to edit and enhance images in the camera. Offers a range of filter effects including Fisheye, Soft Focus, and a clever Miniature Effect that makes images look as if they are photos of miniature scale models. Smart portrait system: advanced automatic features for perfect portraits. Smile Timer takes the shot when your chosen subject smiles. Blink Proof alerts you when someone had their eyes closed. Skin softening adjusts uneven skin tones on people’s faces for smoother looking skin. Easy Auto mode selects the optimum Scene mode for popular photographic situations. Subject Tracking AF will keep the camera focused on a selected subject, even if it is moving around. Unique slideshow with 7 kinds of music and animated characters. Advanced touch screen: simply slide your fingers across the screen to scroll through results, or touch the screen anywhere to set the correct focus and exposure or begin recording a movie. Features Handwritten memo and paint functions that let you write directly onto the screen with the supplied stylus, or personalize your images with drawings that will show up when the image is projected. 17 scene modes automatically optimize settings for popular photographic styles, effects and locations.